Our Head BBQ Chef's been our Pit Master since we first opened in 1995. He's trained many of our young BBQ Chefs to stoke the open pit, prepare the meats, and cook them to perfection. That's why we have such a large number of repeat customers. 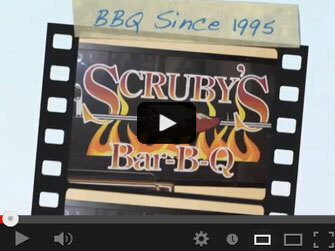 They know they can trust Scruby's BBQ to deliver great tasting food, in a friendly atmosphere, with great service at our Pembroke Pines restaurant! Enjoy our BBQ pork sandwich, quarter chicken, slabs of baby back ribs, and turkey dishes, just to mention a few. Don't forget to compliment your hearty entre with wonderful sides of baked potato, sweet potato, cole slaw, baked beans, French fries and garlic toast. Our BBQ Restaurant consistently delivers the same great smoked barbecue flavor with a little help from our Original Recipe BBQ Sauce!